One not insignificant reason I love links golf is that I can often leave my wedge in the bag, and just use the putter even when well off the green. George Waters covers all the other reasons in “Sand and Golf: How Terrain Shapes the Game” (Goff Books, $40). The book has actually been out for awhile—it won the 2013 Golf Architecture Book of the Year award from GolfClubAtlas.com—but just came across my desk, luckily enough. We’re talking coffee table book here, with pages that are a foot wide to accommodate all the luscious course photos on every spread. Waters is a golf course architect based out of San Francisco, as well as an accomplished writer and photographer as evidenced here. He worked for Tom Doak for years and Doak contributes a Foreword. 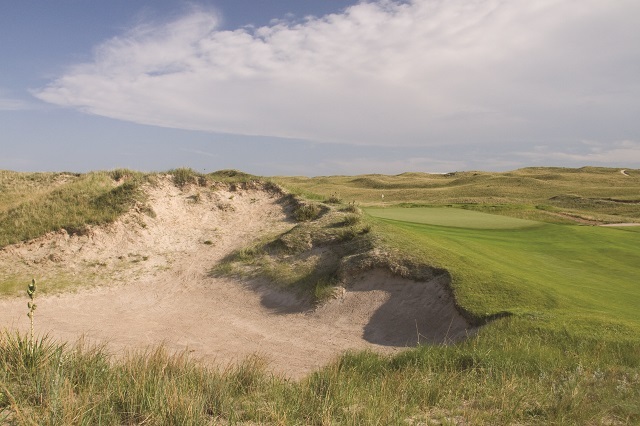 The text ranges over the evolution of a sandy course (though not all sandy courses are necessarily links), its native plants, the general features. Waters discusses how architects consider the wind in their routing plans, inherent strategies that arise, how playable the rough should be. Entire chapters are devoted to bunkers, approach and recovery areas, and greens. But the photography is the real star here, with many of the usual suspects in their green or sandy glory—the Old Course, North Berwick, Sand Hills, Royal Dornoch, Royal County Down, National Golf Links, Shinnecock, Pacific Dunes, Rosapenna, Pinehurst No. 2. It’s all very arousing and therefore frustrating when contemplating a still wintry vista out one’s windows. But it builds up a nice head of steam for spring, and all that fine golf to be played. And, yeah, all that wedge practice, too.